Photographer’s notes: This is my local Cyclo shop, an ASBL in Brussels. Not-for-profit for some of you. I have been regular here for years. Over a decade. I can walk here from my home. They do most of my repairs, and I get most of my supplies here. There are a few other shops about where I spread the small wealth. He also keeps an air-gun and decent standing pump outside the shop for all to use as they need. I like that added value. In all the years I have been there, I did not know he did this service. I walked in because the shop was overflowing and I was looking for a giggle, intending to watch dozens of people desperate to get bikes repaired for tomorrow. Instead, I saw dozens of bike stacked up on display, from vintage to racer, folding to tandems, all on offer. It is why this is my shop. It is why I support local bike shops. 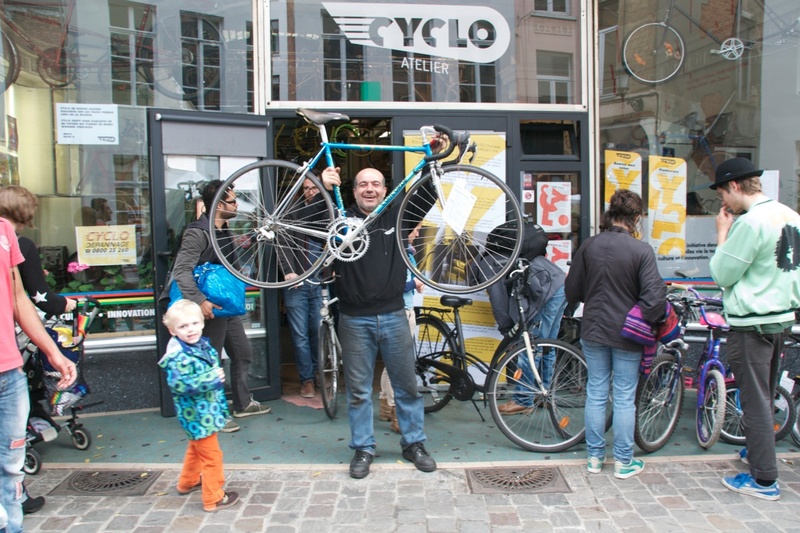 This entry was posted in advocacy, bike shop, Europe, event, family, social engagement and tagged 2015, Brussels, Cyclo, September. Bookmark the permalink.